Genlias is another website that you might want to search if you have Dutch ancestry. This site is a cooperative effort between several groups including regional history centers and archives in the Netherlands and overseas. The information contained on this site has been collected from the Civil Register records including, birth, marriage, and death events since 1811. "Death records from the Civil Register enter the public domain after 50 years, marriage records after 75 years and birth records after 100 years. All records are released in 10-year blocks." Records prior to 1811 were primarily kept at the local church level including, baptisms, weddings, funerals, and statements of successions (documents after a death). As of October 2007 the number of persons contained in this database was 42.560.450. The information contained in this database provides you with the basic information to help you in forming your family records for free. If you prefer to have more information or to view the original records you can place an order for a copy of the documents. 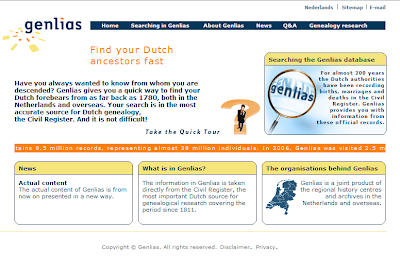 The Genlias site also provides how-to information regarding your Dutch genealogical research. The site can be viewed in Dutch or English. The search engine for the site works nicely and is very easy to understand. If you have problems in searching, a helpful link is provided directly with Genlias to provide you instructions for successful searching. If you would like to research in this site, click Genlias and you will be taken to the home page of Genlias Site in English. If you prefer to jump right in and begin searching click Genlias Search. Have fun!